The 15 year old Oh My G! 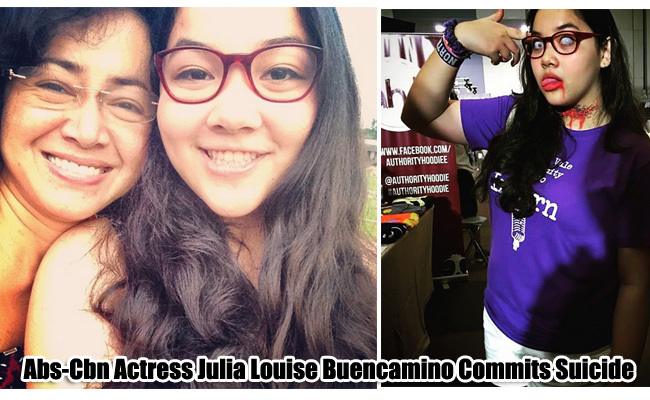 actress Julia Louise Buencamino had been found dead in their home in Quezon City last Tuesday, July 7, 2015. The daughter of actors Nonie and Shamaine Buencamino had been found by the household help, Elsa Orsales, at 8:20 pm as reported by PO3 Victorio Guerrero. Julia had been declared dead upon arrival in Cardinal Santos Medical Center in San Juan. Further reports surfaced that Nonie Buencamino formally waived the investigation as they believe that their daughter had committed suicide. Julia Louise is the youngest among four siblings. She was found by the household help hanging from the ceiling with a nylon cord tied around her neck. Orsales immediately informed Gregorio Martin, Julia’s brother, and they rush her to the hospital where she was pronounced dead. According to Ricky Gallardo, Julia’s manager, the actress showed no sign of depression. The Buencamino family asks the public to give them a chance to mourn in private. They thanked they family and friends for the love, support and understanding. Julia’s remain will be in Mt. Camel Church, Quezon City. A support group created since 2007 had been dedicated to help those who have suicidal tendencies. Natasha Goulbourn Foundation aimed to help people who felt alone and depressed. Councilors are ready to listen to the callers and help.